Approximately 50 demonstrators gathered at Independence Mall Saturday afternoon as part of a statewide day of action to legalize marijuana. 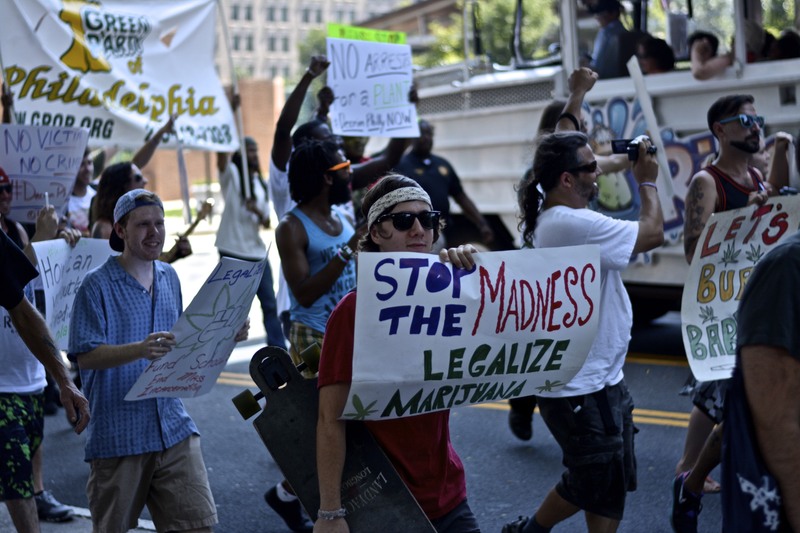 The rally and subsequent march down Market Street to LOVE Park was organized to put pressure on Mayor Michael Nutter to sign into law a marijuana decriminalization bill passed by City Council in June. Observers believe Nutter will veto, although overwhelming support for the bill, which passed 13-3 on June 19th, suggests that the 12 votes needed to override a mayoral veto are present if necessary. Nutter’s Chief of Staff, Everett Gillison, announced on August 26th that the administration would make a decision on the bill no later than September 10th. 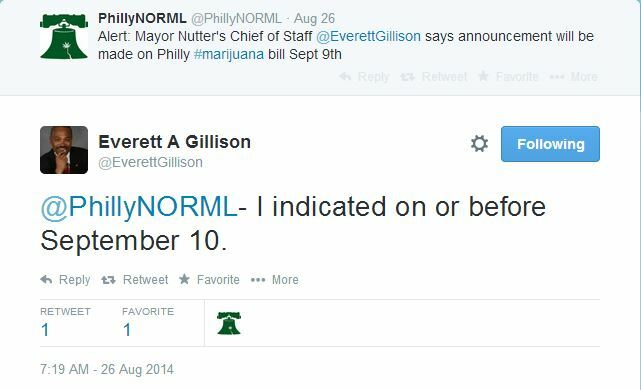 Twitter exchange between Philly NORML and Chief of Staff Everett Gillison on August 26th. “The law is supposed to be equally enforced, and it’s supposed to be clearly enforced. And right now, that’s not happening with marijuana here in Pennsylvania. And it’s clearly demonstrated with the racial disparity in arrests here in Philadelphia,” said Chris Goldstein, co-chair of PhillyNORML. The legislation’s sponsor, Councilman Jim Kenney, countered Ramsey’s assertion, however, by pointing out that other cities and towns in Pennsylvania have softened enforcement on small amounts of marijuana, and the state has not intervened. One demonstrator, Dennis Smith, an African American male in his early twenties, recently began organizing with the Institute for Development of African American Youth. He told The Declaration that he personally has been arrested, fined, and jailed twice for small amounts of marijuana. The Declaration will continue to cover decriminalization developments in Philadelphia. Sign up for email updates and follow us on Twitter and Facebook.